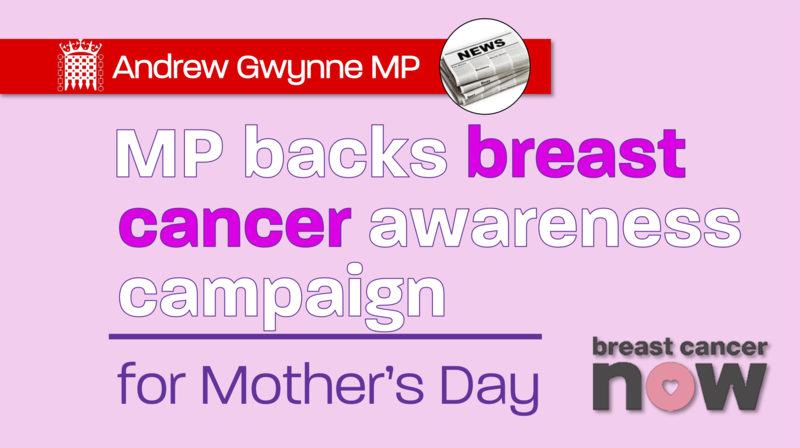 This Mother’s Day, Labour’s Andrew Gwynne is raising awareness of breast cancer and the life-saving work of Breast Cancer Now. Breast Cancer Now funded scientists have made some ground-breaking new discoveries in the past few months and their work is making a real different to cancer diagnosis and the treatment of Breast cancer. Detection – Their research has provided strong evidence that women aged 35-39 and at a moderate or high risk of developing breast cancer due to their family history, could benefit from annual screening. Professor Gareth Evans from the University of Manchester found that tumours picked up through screening, were smaller in size, and were less likely to have spread to lymph nodes, compared to women who weren’t screened. Detecting breast cancer earlier gives women the best possible chance of survival. Breast Cancer Now are working so that these services are offered to women with a family history of breast cancer in the future. Treatment – By analysing how patients’ tumour cells respond to treatment, a team at the University of Edinburgh, part funded by Breast Cancer Now, have identified genetic changes that may predict the likelihood of breast cancer relapse in women who take aromatase inhibitors, which are a common type of hormone therapy. Immunotherapy – Scientists at the Breast Cancer Now Research Unit at King’s College London found that a significant proportion of triple negative tumours, including those that are resistant to chemotherapy, produce high levels of a protein called FRα. They developed an antibody that can label FRα to encourage cancer cell destruction by the immune system which has shown promising results in the lab. They hope to refine and develop this immunotherapy approach to advance it into a clinical trial. Triple negative breast cancers are aggressive, make up about 15% of all diagnoses, and lack targeted treatments. Every day around 150 people will be diagnosed with breast cancer. These numbers represent real women and men. This year’s campaign features supporter Jodi who was only 25 when she discovered she had breast cancer after giving birth to her son. She is asking people to make a donation to Breast Cancer Now this Mother’s Day so they are able to carry on this life-saving research. “I’m proud to be supporting Breast Cancer Now’s Mother’s Day campaign, helping to raise money for their ground-breaking research to enable more mums like Jodi to live, and live well with breast cancer.